The month started off with a heat wave, as a result of an anomalous high pressure ridge over the western US. It’s not obvious on this chart, but the week of September 8th ushered in a big change from the early month heat wave, which I discuss in the precipitation section below. Denver’s temperature was above normal for the past five consecutive months. May 2013 ended a short streak of four months with below normal temperatures. 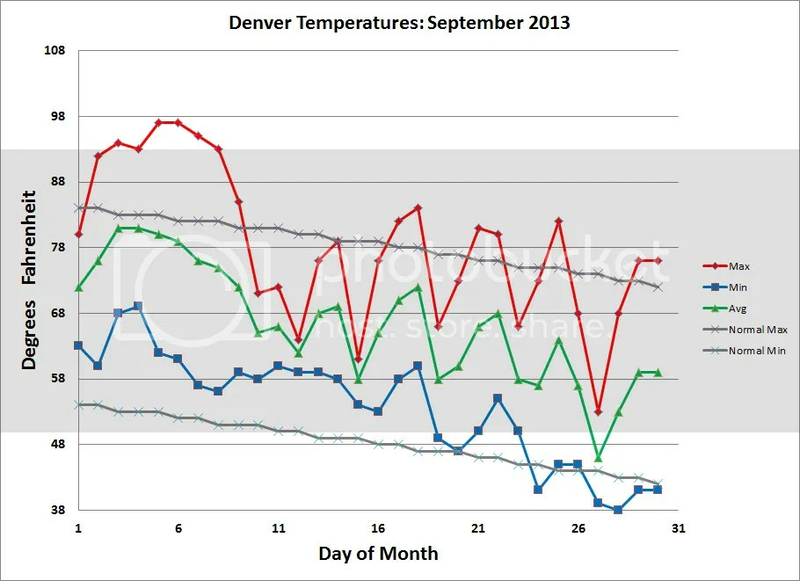 Looking back a little further in time, October 2012 broke last year’s extreme summer heat including the warmest month in Denver history: July 2012 (a mean of 78.9°F which was 4.7°F warmer than normal!). Through September, 2013, there were 57 90°F+ days in 2013, which means 2013 gained sole 4th place status of most 90°F days in one year. Last year, the hottest summer on record for Denver, there was an astounding 73 90°F+ days! Thankfully, this year also featured far fewer 100°F+ days than 2012: 2 instead of 13 (a record number). After last year’s record hot summer, summer 2013 felt comparatively cool, which just goes to show how truly monumental last year’s records were. I haven’t determined if the NWS (or anyone else) collects record high minimum temperatures (warm nighttime lows) in a handy table, chart, or time series. Denver’s 68°F on Sep. 3rd was such a record (previously 67, set in 1947), as was Sep. 4th’s 69°F (previously 64°F, set in 1995 and previous years). I’m curious how Denver’s nightly lows have changed in the past 100+ years. If I find or put something together, I’ll include it in a future post. Instead of amazing temperature records (although 97°F in September is very hot! ), September saw precipitation records. Total precipitation was much greater than normal during September 2013: 5.61″ precipitation fell at Denver during the month instead of the normal 0.92″! Most of this fell at DIA on the 14th and 12th of the month (2.01″ and 1.11″). As I wrote about after the event, Denver and other communities with similar rain totals paled in comparison to southern Aurora and Boulder, which received over 18″ of rain in one week, and more for the month! Given that the normal annual total precipitation for these places is 15″, Denver and other places received over 1/3 of their yearly annual precipitation total in one month – a month that is normally relatively dry. During the week of the 8th, the confluence of a slow-moving upper-level low, a surface stationary front, and tropical moisture from both the Pacific Ocean and Gulf of Mexico generated record rainfall over the northern Front Range of Colorado, including Denver. This rainfall led to devastating flooding, from which communities are just beginning to recover. About the only good news from this natural disaster is it busted the area’s long-term drought. I have written literally hundreds of posts on the effects of global warming and the evidence within the temperature signal of climate change effects. This series of posts takes a very different look at conditions. Instead of multi-decadal trends, this series looks at highly variable weather effects on a very local scale. The interannual variability I’ve shown above is a part of natural change. Climate change influences this natural change – on long time frames. The climate signal is not apparent in these figures because they are of too short of duration. The climate signal is instead apparent in the “normals” calculation, which NOAA updates every ten years. The most recent “normal” values cover 1981-2010. The temperature values of 1981-2000 are warmer than the 1971-2000 values, which are warmer than the 1961-1990 values. The interannual variability shown in the figures above will become a part of the 1991-2020 through 2011-2040 normals. If temperatures continue to track warmer than normal in most months, the next set of normals will clearly demonstrate a continued warming trend. Categories: drought, NOAA, science | Tags: 100F days, 90F days, climate, Denver climate, Denver precipitation, Denver temperature, interannual variability, science, temperature record, The National Weather Service, weather | Permalink.